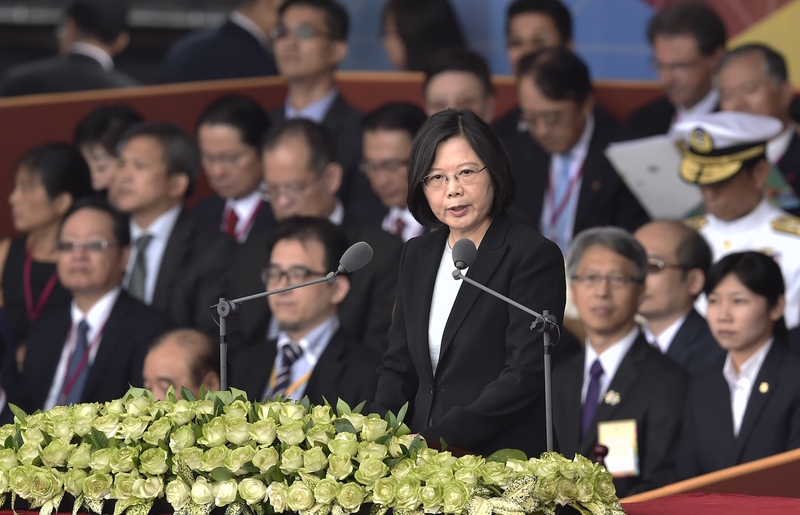 Taiwan President Tsai Ing-wen speaks during National Day celebrations in front of the Presidential Palace in Taipei, October 10, 2016. The recent storm over Taiwanese President Tsai Ing-wen’s 10-minute congratulatory call to U.S. President-elect Donald J. Trump has engendered much speculation about the possibility that an anti-China iteration of President Trump could seek to establish closer ties with Taiwan. Whether this is what Mr. Trump has in mind is anyone’s guess and will be largely contingent on whom he appoints to key positions in his administration. In an ideal world, where morals rather than national power determines the course of history, it would be perfectly sensible for the U.S. president to more closely align his or her government with a successful, peaceful, and democratic nation-state living in the shadow of a giant authoritarian—and expansionist—neighbor. Unfortunately (for Taiwan), that isn’t the world that we live in, and national power very much determines the behavior of major states and how they treat the smaller nations—particularly those that exist at the intersection of spheres of influence—that are inevitably trapped in the currents of powerful relationships. Consequently, although the U.S. and other powers could and probably should do more to support Taiwan, such considerations must be weighed against the costs of hurting relations with China, a key player in international affairs and an economic powerhouse. Unless President Trump is a new breed of leader who calculates costs and benefits using a different system from that used by his predecessors, whatever instinct he may have to bring Taiwan in from the cold, as it were, will be counterbalanced by the requirement to ensure stability in U.S.-China relations—again, not because this is the moral thing to do, but because the national interest trumps other, perhaps less tangible, considerations. Thus, a truly transformative recalibration, one that would affect the fundamentals of the relationship, is highly unlikely and not appropriate in the current context. With this in mind, I would argue that Washington should indeed recalibrate its relations to ensure that Taiwan retains the self-assurance, and just as importantly the means, to continue to exist as an independent, liberal-democratic entity alongside an increasingly powerful authoritarian China. Thus, while a clear break with the past would possibly entail the establishment of diplomatic ties with Taipei (which will not happen), Washington can implement a series of adjustments that will bolster Taiwan’s resilience while agreeing that, for the time being, the “status quo” of no unification and no de jure independence remains the least bad option for everybody involved. While Washington could do more to normalize relations with Taiwan by allowing, for example, more senior Taiwanese government officials to meet with their American counterparts and permitting higher-level visits to Taiwan by U.S. officials, the principal element of a recalibration should consist of the U.S. abandoning its longstanding policy of strategic ambiguity in the Taiwan Strait. This approach has outlived its usefulness and now invites adventurism and miscalculation by Beijing, which could furthermore convince itself that the U.S. is no longer willing, or equipped, to defend Taiwan against an increasingly capable People’s Liberation Army. The U.S. should therefore draw red lines around Taiwan and convince Beijing that any unprovoked attack against Taiwan would result in a military response from the U.S. and its regional allies. By increasing the deterrent value of the U.S.’s support for Taiwan, Washington would lower the risks of war and thereby give Taiwan the space it needs. Taiwan is resilient and doesn’t need a major recalibration in order to prosper. What it needs, above all, is enough support from the U.S. and other allies to know that it will not be abandoned—the rest, including finding a modus vivendi with China, it can pretty much accomplish on its own. During the U.S. presidential campaign, Donald Trump showed a flair for shaking things up with his tweets. More recently, he has done the same with a phone call. While unofficial U.S. ties with Taiwan remain close, previous American leaders kept channels open but shied away from sensitive direct contacts to avoid provoking Beijing. Trump’s advisers seem to be pushing for a greater willingness to support Taiwan and confront China on issues such as Beijing’s claims to much of the South China Sea, the actions of North Korea, Sino-U.S. trade, and currency issues. Then again, this may turn out to be more Trump the showman than Trump the statesman. China initially issued a measured response to the phone conversation but then turned up the heat as Trump tweeted fresh criticisms of Beijing’s trade and currency policies. Trump is technically a private citizen, albeit one who is receiving national security briefings and soon will hold the most powerful office on the planet. The new U.S. administration needs to cautiously recalibrate its unofficial ties with Taiwan, a democracy of more than 23 million people that despite the lack of formal diplomatic relations has close political, economic, and security ties with the United States—not to mention strong people-to-people bonds. The U.S. continues to sell arms of a “defensive character” to Taiwan, but China has maintained a prolonged build-up of its military capabilities, and there is a need for more flexibility on what types of military hardware and services can be made available to the island. In order to do that, Taiwan must also overcome its own internal obstacles to increase its defense budget. The U.S. could also do away with restrictions on visits by Taiwan’s president and vice president, which now are limited to transit stops, and it could permit Taiwan officials to meet U.S. counterparts more frequently and at more senior levels. Even more importantly, the new administration needs to take a more forceful stance on efforts by Beijing to choke off the island’s participation in international organizations that are not political in nature. Taiwan’s representatives were barred from an international steel conference this year as well as international gatherings on health, aviation, and police issues—all because of interference from Beijing. China has also blocked Taiwan’s news organizations from covering many of these meetings. President Tsai’s party has flirted with independence—a red line for Beijing—but her administration has moved cautiously and shown considerable flexibility in accommodating Beijing’s concerns about preserving established norms for continued cooperation. Beijing, however, has rejected her overtures, choosing to focus on the fact that she has not fully accepted its terms. As a major contributor to the funding of some of these international organizations, the U.S. has the ability to flex its muscles and push back on Beijing’s efforts to squeeze Taiwan off the global stage. The new U.S. administration, like its predecessors, will have to engage China on a range of global, regional, and bilateral issues. But within the established framework for dealing with Beijing, there should be considerably more space for Taiwan. As a matter of principle, yes, I agree with Ms. Chen, above, that Taiwan has an enormous amount to contribute to the international community, and its 23.5 million people have worked very hard and sacrificed much to build what they have: a democracy with the highest press freedom ranking in Asia (except Australia, according to the 2016 World Press Freedom Index). Policy tweaks like the Taiwan Travel Act are, in the light of principle at least, modest, reasonable, and only fair. It is also reasonable to ask where these steps, modest as they are, ultimately lead. Principle, as the Taiwanese well know, often involves sacrifice. What consequences is the U.S. willing to accept, several steps down this road? What is the ultimate goal of Taiwan policy? I am reminded of a conversation I had with a taxi driver in Taiwan a few months ago. Still seething from a recent encounter with Chinese tourists who had said China could easily take Taiwan by force, he told me cheerfully that America was sure to come to Taiwan’s aid in such a situation. America sticks by its principles, he said, especially where its interests are involved. The pivot to Asia showed that America sees Taiwan as key to its interests. “I told them, ‘Go ahead and attack! I hope you do! See what America does!’” he reported, smiling. I responded with less enthusiasm—thinking, but not saying, that I wondered whether most Taiwanese would want to fight in such a conflict—and noted that Americans since the Iraq and Afghanistan wars are more skeptical of calls to spend blood and treasure. None of this is to say that bills like the Taiwan Travel Act should not be passed. But we should understand clearly our reasons for doing it. Given the president-elect’s rhetoric, it is perhaps moot to discuss principles, as opposed to interests (including, although one is loath to think it, personal business interests that span the globe). Indeed, any coherent long-term policy may not be soon forthcoming. But it has never been more important. Newly elected American presidents, going back to Reagan, have a long history of dialing up rhetoric about recognizing or defending Taiwan in the immediate aftermath of their election victory, and then eventually backing down over the first several years of their presidency. The obvious explanation for this is that Taiwan is a valuable bargaining chip, something to effectively threaten and push Beijing with while negotiating other aspects of Sino-U.S. relations. Over the weekend, as the premeditated nature of the Trump-Tsai phone call became clear, this once again emerged as the most plausible explanation, and Beijing’s measured response only seemed to reinforce its plausibility. In fact, compared with the rhetoric issued by Reagan and George W. Bush, Trump’s phone call probably did not seem quite as threatening to Beijing, which has a much longer institutional memory than many American commentators appear to have. The danger in all of this, from the Taiwanese perspective, is that Trump is setting Taiwan up for a longer-term fall, as Reagan and Bush arguably did once they began requiring China’s cooperation on other issues. In Trump’s case, if his campaign rhetoric is to be believed, he would like to renegotiate America’s trade and military relations to the Asia Pacific, while ensuring that China does not attempt to take advantage of the ensuing geopolitical unrest. Meanwhile, he does need Chinese cooperation on North Korea, and potentially Iran. Playing up U.S.-Taiwan relations would seem to be a fairly strong table-setting move in advance of these complicated negotiations. The problem is what happens if, and when, the Chinese agree to some of his demands, but demand that, in return, the U.S. take a softer approach on Taiwan, or at least stick to the institutional status quo. All American presidents over the past 30-odd years have taken that deal, which gave China the space to apply further pressure on Taiwan from other angles. Over the long run, this has led to a slow but steady deterioration of Taiwan’s international stature—even if it was not accompanied by a serious deterioration of its basic military security. It is not at all clear that Trump’s foreign policy team has any strong incentive, ideological or pragmatic, to truly reverse this trend, so long as, in accordance with the basic status quo, China does not seek military reunification in the absence of a Taiwanese declaration of independence (which seems unlikely, to say the least). In the broader scheme of things, the phone call really may just have been politics as usual. Disagreements over Taiwan’s status are, in the end, disagreements about the appropriateness of applying a particular legal concept. That concept is statehood. If there were a single clear norm defining when an entity is or is not a state, and if that definition had a single, clearly assigned interpreter and applier, then it might make sense for the U.S. or other actors to press the issue. But that is not the case. The law and politics of state recognition are equally convoluted as a practical matter and in terms of their underlying theories. The dispute between the two main competing schools of thought on the subject in international law, the “declaratory” theory and the “constitutive” theory, has never been resolved. Put simply, the former theory holds that a political entity is a state as long as it meets a set of given criteria (usually those from the 1933 Montevideo Convention on the Rights and Duties of States: (i) a permanent population; (ii) a defined territory; (iii) effective government; and (iv) capacity to enter into relations with the other states). Under this view, U.S. actions vis-à-vis Taiwan would make little difference in deciding its statehood. The “constitutive” theory, by contrast, holds that a state doesn’t hold that status unless and until it is actively “recognized” by existing states. Though this perspective has been criticized as vague, ad hoc, and discretionary, it captures an important truth about the international legal system: There is no ultimate judge or Supreme Court to tell us when a norm has been accurately applied, there are only judgments by individual members of the community of states (and affiliated non-state actors). Some questions as to statehood simply are ambiguous, with no right legal answer out there waiting to be applied. China’s anxieties make more sense in this context. Any U.S. action that is seen as moving towards or hinting constitutive “recognition” of Taiwan is perceived as highly dangerous. For some in the People’s Republic of China’s (P.R.C.) Communist Party and military bureaucracy, this may no doubt seem like an existential threat—after all, when you start “recognizing” some governments, you can also start “de-recognizing” others, as happens in any interventionist regime change scenario. But there’s another aspect of the politics of recognition that we should pay attention to. Aside from symbolic humiliation in international forums, China has been largely content to let Taiwan develop itself economically, socially, and politically for the past several decades. It has not imposed major economic embargoes, for example. Even though its “hands-off” pragmatism with regards to Taiwan has allowed the latter to develop in ways that help it clearly satisfy the Montevideo criteria for statehood, China is well aware that the real key is recognition by other states. By controlling that one variable, China has no need to focus on exerting other forms of pressure. Certainly, the Trump team’s (obviously calculated) hinting at an upset of the status quo does not rise to the level of official state recognition. And Taiwan’s leaders, citizens, and civil society organizations should be allowed to expand their freedom of movement and communication with other states (which is actually better than some might think at the moment—for example, the P.R.C. has wisely not sought to prevent ordinary holders of Republic of China passports from receiving visas to travel abroad). But “head of state”-level conversations do not expand these freedoms for ordinary Taiwanese citizens or working-level government agencies or representatives. Instead, they symbolize what China sees as the threat of state recognition; and further “hints” in this direction would undoubtedly result in unpleasant forms of pressure that would be felt by ordinary citizens of Taiwan. The U.S. can and should do more to push China to allow Taiwan breathing room in the international system, but it should do so in granular, practical ways (such as “observer” involvement in U.N. bodies) rather than via exciting, symbolic gestures. Taiwan is a de facto sovereign state. At the same time, nobody with a sane mind in Taiwan right now would try to declare formal independence and risk a war with the P.R.C. In between de facto and de jure independence, there is a lot of room for the international community to engage Taiwan. Yu-Jie Chen and others have raised some interesting examples above. But unfortunately, Beijing wants all of us to pretend Taiwan does not exist or it is already a province of the P.R.C., pressuring all international bodies to exclude Taiwan or only accept Taiwan’s participation in the name of “Chinese Taipei.” The World Bank and the IMF exclude Taiwan data from their world economic dataset, creating a huge inconvenience for students of world development. The U.S. and the international community have long been treating Taiwan more or less according to Beijing’s rulebook. This started during the Cold War. In the 1970s, when the U.S. was losing in Vietnam, Washington recruited Beijing to become a counter-revolutionary force that checked the expansion of Vietnam’s and Soviet Union’s influence in Southeast Asia, as well as hampered the many rural communist guerillas that the C.C.P. once sponsored. This rapprochement with the P.R.C. served the U.S. well back then, as it prevented the domino nightmare that Washington feared most following a Vietcong victory in Indochina. In return, the U.S. shifted its recognition of Taipei to Beijing, and let the P.R.C. replace Taiwan in the permanent seat in the U.N. Security Council, a seat the Republic of China (ROC) earned at the end of WWII. Washington’s termination of any formal diplomatic relations with Taipei was the price of securing the P.R.C.’s allegiance with the West during the Cold War. After the collapse of the Soviet bloc, Taiwan continued to consolidate its position as a high-tech innovation powerhouse in the global economy. It heroically transformed itself from brutal authoritarianism into a stable and vibrant democracy. While Taiwan’s economic and political achievements deserve worldwide recognition, Cold War inertia continued to cause the world to ignore Taiwan in exchange for harmony with Beijing. In the 1990s and 2000s, this inertia seemed justifiable, given the perceived significance of Beijing’s goodwill in restraining North Korea and maintaining peace in the South China Sea. Nonetheless, more recently, North Korea, with a nuclear bomb that Beijing allegedly helped build, has moved beyond Beijing’s control. And China’s increasing assertiveness in the South China Sea has started to alarm its neighbors. When China is no longer a constructive force that helps safeguard the peace of the geopolitical status quo in the Western Pacific, or even becomes a destabilizing force itself, compliance with Beijing’s rulebook on Taiwan ceases to serve much purpose. Denying democratic Taiwan the respect and recognition it deserves, in exchange for Beijing’s falling cooperation on other matters, is increasingly costly to American interests and the reputation of the United States. A recalibration of U.S.-Taiwan relations is overdue. President elect Trump’s phone call to Taiwan President Tsai represents a welcome change to the U.S.’ standoff approach to the island nation that calls itself the Republic of China. It conveys recognition of the ROC’s remarkable democratic transformation over the past 30 years. This process has made Taiwan the first Chinese political entity vesting political decisions in the people themselves, rather than in self-appointed leaders such as those who have ruled the mainland of China now for over 67 years. Taiwan’s accomplishment gives fresh hope to the people of Hong Kong, who also aspire to choose their own leaders, unrestrained by the stultifying hand of Beijing that insists only the Communist party leadership can make such decisions. America has been Taiwan’s unique supporter now for many decades, despite the shift to formal diplomatic recognition of the Beijing government in 1979. While the roots of this relationship were forged in the early years of the Cold War, in more recent times they have been more deeply grounded in our shared values. These include democratic elections, a free and vibrant press, and an independent court system. Taiwan’s economic success has also been a source of great admiration by its American friends. While it is unrealistic to expect the U.S. would shift its diplomatic recognition back to Taiwan from the P.R.C., there are further steps a Trump Administration could take to acknowledge and support Taiwan’s unique contributions to peace and prosperity in East Asia and the world. Permitting greater participation in international organizations such as the International Civil Aviation Organization and the World Health Organization would be one welcome step. Approving further contact and cooperation between our two governments, through the existing institutions of the American Institute in Taiwan (AIT) and its Taiwan counterpart, Taipei Economic and Cultural Representative Office (TECRO), would be another. We also should offer more dignified transit of the United States by President Tsai, Foreign Minister David Lee and other top representatives when they travel to the Western Hemisphere (where they still enjoy a number of diplomatic allies). Of course continuing to provide defensive weaponry to Taiwan’s scrappy military is an essential aspect of our relationship. So is the clear reaffirmation that the United States military would not stand aside if Beijing ever threatens Taiwan. All of this is consistent with the tenor of American support for the island over the past 67 years. It also sends a signal to all of Asia that the United States stands by its friends, its principles (particularly our admiration for open political systems and free and fair elections) and its values (respect for justice and individual rights). I was one of the first former U.S. Ambassadors to sign a letter critical of candidate Trump’s policies last summer. I still have many concerns about his presidency, particularly in the foreign policy realm where I spent over three decades representing our country around the world. This has included serving as the Director of the American Institute in Taiwan, our unofficial but very effective mission to the Taiwan government and people. But I applaud Mr. Trump’s decision to reach out to Taiwan’s leader, and my friend, President Tsai. I hope this is also a sign that the Trump Administration will reinforce the strong American diplomatic, economic, and military engagement in Asia that has played such a critical role in that region for many years. That is a particularly important message to send to our allies in Tokyo, Seoul, Manila, Bangkok, and Canberra. I took a call. I heard the call was coming probably an hour or two before. I fully understand the One-China policy. But I don’t know why we have to be bound by a One-China policy unless we make a deal with China having to do with other things, including trade. I mean, look, we’re being hurt very badly by China with devaluation, with taxing us heavy at the borders when we don’t tax them, with building a massive fortress in the middle of the South China Sea, which they shouldn’t be doing. There is a lot to unpack in this interview and what it bodes for U.S. strategy toward China. But as it pertains to the subject of U.S.-Taiwan relations, these comments are quite revealing. To Trump, Taiwan is but a pawn in Chinese trade negotiations. There’s zero principled stance here. Trump does not even pay lip service to Taiwan’s vibrant civil society, liberal government, and openness toward America. In the ChinaFile discussion above, some folks have called for a reassessment of U.S. policy toward Taiwan, with an eye toward more closely aligning with the democratic and open side of the Strait. I myself also hold the view that Taiwan’s fate is important both for principled and strategic reasons, and the failure of China to liberalize should have America rethinking its approach toward Taiwan. But in addition to all of the other signals from Trump—silence on democratic values, explicit support for autocrats, top administration nominees who have close links with Xi and Putin—he has all but stated in this interview that Taiwan is a bargaining chip to get more out of bilateral Chinese talks. This not only reflects a disregard for Taiwan’s significance as a partner and free nation in Asia, it opens up the possibility that if China offers the U.S. significant inducements in trade or economic policy, Trump would just as well throw Taiwan under the bus. Just as Americans are actively speaking out against Trump’s indications that he would challenge certain democratic values within our borders, the foreign policy community should push back against Trump’s moves to discard democratic principles as a U.S. interest outside our borders.